How has Anger-Soothe helped others? How do I use Anger-Soothe? Every single day most of us have become angry at one point or another. Perhaps it was stubbing our toe or having a fight with our partner. Perhaps we discovered we’d missed a promotion at work, or left the stove on and burnt the house down! A normal reaction to all of these occurrences is to become unhappy and angry. However, because anger is an emotion, as with any other emotion, there is a very wide range of levels of anger. For some individuals it may take quite a lot to get angry, and with others the ‘fuse’ is a short one. When signals are sent to the brain to arouse anger, signals are also sent to other parts of the body. The heart rate may increase, hands may shake or tremble and increased blood flow to the face may cause it to become red. Scientists are still investigating the link between anger and impulsivity – as the angrier we become the more likely we are to be irrational and impulsive. It short, when we become angry, we may act without ‘thinking’! For some, anger outbursts are the result of genetics, chemical or hormonal imbalances or other psychological problems such as bipolar disorder or depression. For the most part however, anger outbursts are a learnt behavior and the result of poor anger management. Many people will bottle their anger and other emotions and then when it all gets too much, these emotions burst out in an uncontrollable rage. The good news is that these reactions can be unlearnt and healthy anger management skill can be adopted. Anger outbursts can have damaging and far reaching consequences. They can greatly affect relationships with family and friends, and may start to affect other areas such as work. It is therefore important to take the necessary efforts to address the root causes and find better ways of managing our anger. In today’s modern world, it may take a lot to resist the urge to get angry. However, there is a lot that can be done naturally to manage this emotion. When you begin to feel flustered, take a deep breath and count to ten. This may sound juvenile, but as you count in your head, try to picture the rational way to handle things (it may minimize the damage you may do while angry). Try to picture an oasis of calm, however hard this may be! It is not a good idea to vent anger, as this may become a habit that fuels the cycle. Instead, try to take up an energetic sport that requires concentration, (preferably not a contact sport), such as racket-ball or rock climbing. Exercise is a great way to relax and work off some steam. You don’t have to be a Zen master to soothe your mood. Natural remedies can also help to support calmed demeanor and balanced emotion. In fact, natural remedies have been used in traditional medicine for thousands of years to support the healthy functioning of the brain and nervous system. Anger-Soothe is a 100% natural homeopathic remedy formulated to soothe acute feelings of anger and help to prevent temper outbursts. Anger-Soothe can be used to safely support the nervous system and at a cellular level, without harmful side effects. This remedy contains a selection of homeopathic remedies known for their ability to address emotions of anger and irritability and sudden temper outbursts. Due to the concentrated tincture formula, Anger-Soothe Drops are absorbed into the system with ease – exactly when you need it! Nux vom 6C – a tissue salt used as a cellular nutrient for the nervous system and brain to support calmed mood and balanced emotion. Chamomilla 6C - is a soothing natural remedy frequently used when the emotional reaction seems out of proportion to the situation or event. In Sao Paulo mothers used Chamomile effectively to calm their children and this was confirmed in a study. (Alves, A. R. and da Silva, M. J. “Use of phytotherapy in children up to 5 years of age in a central and peripheral area of the city of Sao Paulo”. Rev Esc Enferm.USP. 2003;37(4):85-91). Lycopodium 6C – this homeopathic remedy is used to address symptoms experienced by individuals who are said to be ‘highly strung’ or volatile. Anger-Soothe contains no gluten, artificial flavours, colours or preservatives. It is suitable for vegetarians and safe for all ages. 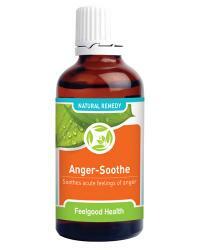 Anger-Soothe is presented in a concentrated 50ml tincture formula, making it easy to take. Hold bottle upside down and administer 10 drops directly into the mouth. Alternatively dilute 10 drops in quarter cup water and sip slowly. Dosage may be repeated 3 - 5 times daily if needed until symptoms subside. May be used with MindSoothe Capsules for ongoing emotional wellbeing. Anger-Soothe is often recommended along with our PureCalm anti-stress remedy for adults. Children can also use our Tantrum Tamer to stabilize mood. Anger-Soothe supports the body on a cellular level – helping to support the nervous system - from the first dose. Anger-Soothe contains homeopathic ingredients in a tincture formula that facilitates rapid absorption into the system – just when you need it! One bottle of Anger-Soothe will last approximately 30 days (depending on frequency of use). My son has temper tantrums; I use your product Tantrum Tamer for him, and this for me! I find it really works to soothe the temper almost immediately. Especially on days when I could just SCREAM! Safe for pregnancy and all ages, calms anger outbursts and balances mood swings!